Bonjour lecteurs! I hope you are in a good mood as it’s nearly the weekend? Well, to make you smile, we have another fab giveaway in our 12 Days of Frenchie Christmas aujourd’hui. Now that we spoilt you with some fab footwear (worth £23!) and some cute skincare products (worth £50! ), we are now going to give you the chance to get some fabulous food! 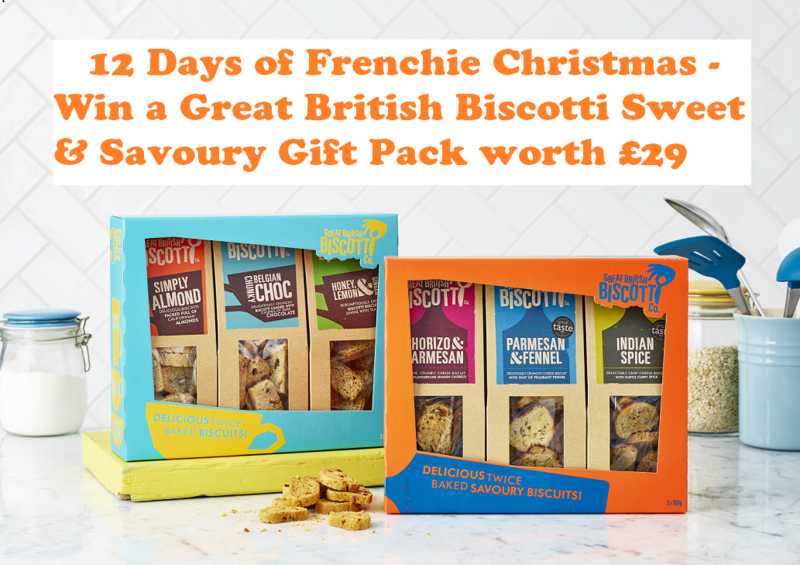 Win a Great British Biscotti Sweet & Savoury Gift Pack worth £29 with this new comp! And really, this pack is parfait for the festive season. We discovered the Great British Biscotti Company while we visited Top Drawer. We had the chance to try some of these biscotti (un peu d’italien on the blog today!) and they are délicieux! Did you know that a foodie revolution happened in Dorset? Bored of your traditional biscuits? Then you will love this brand! The Great British Biscotti Company offers a full repertoire of enticing flavour liaisons (of both a sweet and savoury persuasion) and a couple of thoughtful foodie formats, from the traditional dunking fingers to the more avant-garde biscotti crouton. Wich one do you want to try? So much choice means you can enjoy the brand’s products in so many ways! Canapés, cheese boards, salads and soups (like tea & coffee) can now enjoy an extra indulgent biscotti twist and what a delicious one! This new exciting and delicious range of sweet biscotti is now available on Not On the High Street. A wonderful Gift Box with 3 delicious flavours of Biscotti – Almond, Chocolate and especially for tea drinkers our Honey, Lemon & Ginger Biscotti. This pack is le parfait present to a loved one or closest friend! Or you can simply hide it away and keep it for yourself while you watch TV! Savoury Biscotti makes a wonderful snack with a drink or Canapé/Finger Food Base or compliments any cheese board or charcuterie platter. J’adore the Parmesan & Fennel version but the Chorizo one is the hot bomb for Christmas! Feeling like you could do with a sweet or salty treat today? Visit the Great British Biscotti Company’s website and discover many fab flavours! You will find for sure some great products to surprise your guests at Christmas! Not sure which pack you want to try first? Looking for something different to taste this Christmas? It’s your lucky day! We teamed up with The Great British Biscotti Company and you can now win a Great British Biscotti Sweet & Savoury Gift Pack worth £29! Wow! It’s so important to have some good food over the festive season and this pack will not disappoint you! Win two pack of savoury snacks! Enter this new 12 Days of Frenchie Christmas giveaway now via Gleam! This giveaway starts on Friday 8th December at 12 pm and ends at midnight on the 8th January 2018. Provision of the prize is the responsibility of The Great British Biscotti Company. I hope you liked reading our new 12 Days of Christmas giveaway! We have more fab competitions coming up for the next few days to celebrate Christmas. So make sure to come back every day and enter them all! We have hundreds pounds worth of goodies just for you! Tomorrow, we will be back with a fab kids’ fashion brand and you will win some cute clothes! 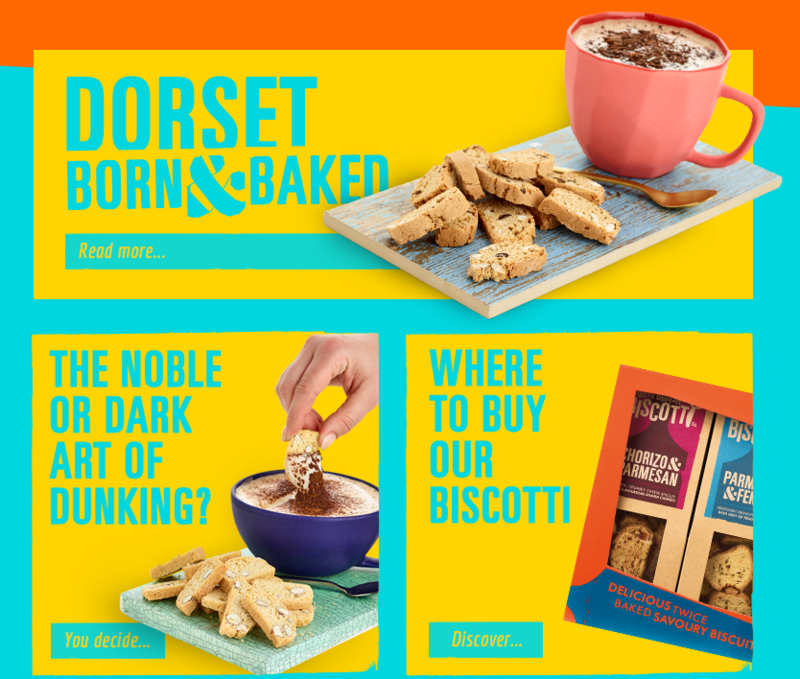 Disclosure: This is a collaborative post with The Great British Biscotti Company. I love chilli seeds and nuts. I like all sorts of snacks – slight favourites are salted peanuts for savoury and chocolate covered dates or raisins for sweet! My favourite snack has to be chocolate chip cookies with a nice glass of milk. My favourite snack is dried mango bits. I like popcorn, its never in the house for longer than 5 minutes before we have all dug in to the bag. I’m a complete chocoholic. I can’t say I have a favourite as such, anything goes as long as it’s related to chocolate. I am partial to chocolate digestives. Cherries are my favourite snack! I’m a chocoholic so anything that includes chocolate such as boxed/bars of chocolate, sweets, cakes or biscuits is my favourite. My favourite snack is mixed raw nuts and dried fruit. Popcorn is my favourite snack. I enjoy a biscuit or two! Cheese & Onion flavoured crisps. Has to be my protein bars. I like to snack on cheese and crackers! Green Olives with salted almonds! My home-made Victoria Sponge or Cherry and Almond cake. Anything crunchy, love crackers and pate. It changes from week to week but I’m pretty into chocolate chip Snack a Jacks. My favourite snack is almonds and carrot sticks 🙂 can’t get enough of them! I love mixed nuts but I also love biscotti and have made it several times. My favourite snack are cheese straws! Cheese and crackers and crisps are my guilty pleasures. I love pretty much any sort of chocolate. My favourite snack is cashew nuts. Sometimes I get them with black pepper. Mine is nuts, especially cashews and macadamias. Honey roasted cashews and peanuts! I guess it really depends what mood I’m in, but saying that i’m always in the mood for chocolate. I have a weakness for biscuits – rich tea biscuits are my go-to snack!